In fact, it has been a year since I last wrote something. Almost a year since I really used Twitter. I wasn’t against these things. I am not anti-writing, anti-Twitter, anti-social media. In fact, I learned more on Twitter than I did through so many other academic medias. Here is what happened...my last post was called “Every Child’s Story Matters” --- I wrote that post wanting to share with other educators the idea that each child, every one, matters. That their stories matter, and it is our job to know them. Yet after a week went by I logged onto Blogger...not to write something new, but to see how many people read my blog. How many likes did I get on Twitter. How many people shared it with others. Then the thought hit me...What am I doing? I went into education for one reason, and one reason alone...I wanted to make a difference. I wanted to help students gain a better sense of self-efficacy, a better idea of who they are, to reach newer heights and to one day look in the mirror and see the person they always dreamed of becoming. Idealistic? Maybe, but it was and is the truth I hold on to. It was on my couch, with my chromebook in hand, as I was checking the number of likes I had received when I faced a very harsh truth...I was making it about me. While I meant every word I had written in the past, and still do to this day, there was a moment when I crossed the invisible line from sharing a love of teaching with others to self-promotion, and the focus shifted from students to me. I was meeting with some colleagues one morning when one of them used the word “EduCelebrity” --- For those of you who have not heard of this term, here is how it was explained to me: In essence, it is an educator, who through the educational lens, has become famous or popular by sharing all they do and all they believe with others. Now, I was not, nor will I ever be, someone who was at that status. Yet, if I was honest, a year ago, I would have thought that sounded pretty great. That of course….well, for me anyway...is a major problem. As educators, I truly believe our primary calling is to put others before ourselves. We are in the service business, and one that requires our full attention. We are not producing products or creating ways to make more money. We live to love and serve our students in order to help them be the best people they can be. It’s not about us, never has been, and I don’t think it ever should be. The problem lies in our culture today. We live in a self-focused world. Facebook, Instagram, dating cites, about me pages, Twitter, Voxer, and so many other sites I don’t even know about...they are self promoting machines. We strive to share our stories and our image, we take photos of ourselves and then share that photo with others...Why do we do this? I can’t imagine my father watching me as a child learning how to ride a bike, stop...run over just as I make it a few feet on my own, all to make sure he got a selfie next to me to share with all his friends - #learningtorideabike - in order to see how many people like that moment. That never used to be a thing, and now? We have to share our moments with everyone. Our world, our culture, is self-promoting and self-focused...and you know what? It’s addicting. So addicting in fact that I took what was an innocent learning tool, and found a way to make it all about me. I am not trying to be negative or ridicule anyone... Yet, think about this for a moment. Our children are being raised in a world where parents are quick to take photos of their children’s defining moments, only to share them with other adults in order to make the parents look and feel good. Not the kids. Yet, we tell ourselves we just want to stay connected, but is that really the motivation? If we are honest? Here is the question I faced one year ago...Am I using media to learn and grow in order to help my students? Or, am I using media to promote myself, only disguising it as being connected and sharing for the good of a learning community? My answer was simple...It was ultimately about me. Not that I was doing anything wrong. Not that I wasn’t fighting for my students every day. Yet, when the need to see how many people liked a Tweet overtook my need to learn, it was time for a break. One year later, I am ready to connect to learn once again. I share this with the heart of reflection. Not to ridicule, or point the proverbial finger at others, but to simply ask that you take a moment and reflect. It was amazing how much time my mind was away from the things that are truly most important...Faith, family, friends and students. It was amazing how often I checked my phone to see likes or what people might have shared that may have impacted me. I have learned so much from others on Twitter, blogs and other media outlets. I loved being connected to other educators who wanted to share ideas and help me think critically about what we do each day. Yet, it took a year away for me to understand that there is a very real invisible line that separates a life about others and a life about myself. I love being an educator. It’s challenging, and it requires a selfless love that is difficult to live in each day. However, it’s truly worth it. I have missed being connected to other educators, missed reading the amazing stories of student triumphs and ideas shared. Yet I needed a new lens in place that was formed by taking a step back and remembering what education is all about...our students - Just like it should be. It doesn’t matter if they are entering pre-kindergarten or getting ready to graduate next week, they have a story. That story, their narrative, is everything. As educators, I think we often find ourselves in the mindset that our job is to teach content...and content alone. Before going into administration I taught fifth and sixth grade, and I was very much under that impression. I knew relationships were important, I knew my students needed to know how much I cared about them, and their success. Yet what I lacked, what I failed to see, was the reality that every child comes with a unique background, a different story, and one that shapes the way they come to school, the way they learn, and the way they grow. Our students need to understand, need to know, that we see them for who they are...amazingly wonderful individuals. It doesn’t matter which school you work at, the demographics you serve, the percentage of free or reduced lunches provided, the number of parents in the home, or the vocabulary they use… None of that matters, because every child has a story that is vital to who they are, no child is exempt from having one. So in order to truly be effective, in order to truly reach every child, in order to be the best educators possible I believe we need to do all things with this thought in mind: My students all have a story, are all individuals, and every one of them needs to know I love them, will take care of them, and know I will do all I can to understand what they need to learn and feel safe. What would happen if an entire school decided to put love first? As a Christian, my faith, and everything I believe in, is founded on the idea of love. I don’t believe in human perfection, I don’t believe in a life without mistakes, I don’t believe in judgment, and I certainly will never believe in the idea of anyone not being good enough to be loved and accepted for who they are. So I must ask again, what would happen if an entire school decided to put love first? What would happen if an entire staff focused on building genuine relationships with each other beyond the surface, always assumed the positive, and decided to support each other, rather than see the flaws we are naturally going to have since we are all human? What would happen if an entire staff decided their mission is about building students up, their mission is about focusing on the positive, their mission is about understanding why a student is struggling so we can best support him? What would happen? A child’s story can often help provide the reason for needing grace. Yet how often in moments of frustration is it easier to send a child away rather than remember their story? How often do we find our frustration begin to take over with a student refusing to work, when the truth is his story is one of brokenness, a lack of success, and a need for forgiveness? How often do we tire of that student who wants to answer every question out loud without raising his hand, only to forget he is starved for attention at home, and is expected to get all A’s and just wants someone to see him for all his efforts? How often do we tire of the student throwing his things, only to forget a diagnosis that would be so challenging if it was us in his shoes? We have no power to control a child’s story before they come to us, regardless of what that story might be: Homeless, broken, tired, has seen things no child should, has successful parents too tired to invest in him, everything has always come easy to her, struggles to see his value, regrets her past decisions… What we can control however, is the story that takes place after they enter our building and classrooms… I never felt more safe than at school, I was never more recognized and accepted than at school, I never felt success like I did at school, I was truly loved in my second home - called school. Every child's story matters. Maybe it’s time we start to focus on that narrative, and believe academic success will come when a child truly feels loved, supported, accepted, and heard. After all...If we focus on love, if we focus on grace, how could we possibly go wrong? You may not know me, but I am an elementary school principal who has the privilege of working alongside wonderful people like you every single day. 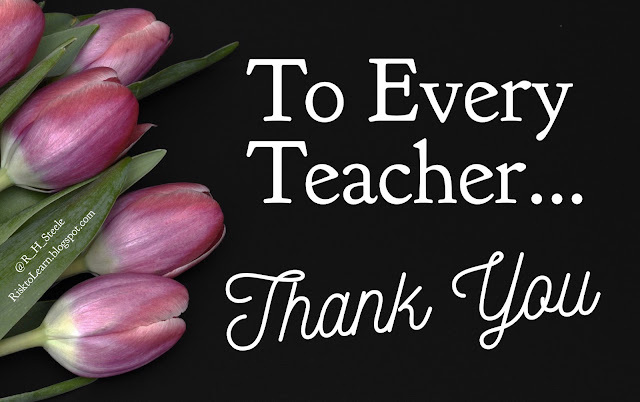 To all teachers, counselors, paraprofessionals, and administrators...I wanted to take a moment to say thank you. Thank you for making a difference in the lives of students each day. It’s truly amazing the number of stories I have heard from students who come to school and find your classroom more of a home than the place they left that morning. The number of times I heard about how your love and support provided more comfort and encouragement than you may have ever thought possible. The number of times I have heard about the relationships you've built, and the impact they've had. Stories of perseverance, grace, love, community, joyful learning, risk taking, challenges conquered, and stories shared. Thank you for putting countless students and teammates before yourself. Thank you for embracing the idea that this life, this profession, is not about you, but rather...the students and families we serve. Thank you for giving everything you have to the students who may never say thank you, or understand the impact you have had until much later in life. Thank you for planting the seeds of success, encouraging students to believe in the impossible, and building a mindset that is focused on not-yet, instead of can’t. Thank you for staying late and working weekends, worrying about that student who just isn’t understanding the material, and being willing to be a stable and positive role-model that offers grace when it would be much easier to show frustration and anger. Thank you for being a smiling face at your door each day. Thank you for pushing through the challenges in your life in order to put the needs of your students first. Thank you for being you...mistakes and all. For being willing to model the imperfections of planning, laughing through the failed lessons and messes made. Thank you for remembering that school is not just about grades and attendance, but life lessons and ideas shared. Thank you for choosing a profession that is always challenging, always changing, and always needing your best. Thank you for choosing a profession that requires sub plans for sick days, and back up plans for technology outages and lessons that took half the time you thought they would. Thank you for choosing a profession that requires you to love openly, forgive daily, show grace often, and be flexible as each day rarely goes as planned. Thank you for buying snacks for your kids. For buying new shoes, clothes, school supplies and backpacks. Thank you for waiting in the office with a student whose parents just can’t seem to make it on time each day for dismissal. Thank you for drying tears and offering encouragement. Thank you for creating a safe place to learn, and being a protector of every child you come in contact with. Thank you for never giving up, and embracing the weight that comes with a student’s education on the line. Thank you for working with challenging parents, constant pressure of student performance, and the inevitable change that is always around the corner. Thank you for being a teacher, an educator, a counselor, a paraprofessional, an administrator...we all get one life to live, and I can’t thank you enough for giving yours to others. What you do each day may not always be noticed, may not always come with a thank you, may not always feel as successful as you wish it would...but please remember this: You make a difference, you matter, you provide love and safety, acceptance and support, and you change lives each day. In the end, when it’s time to say goodbye to the classroom or the campus you serve, know you lived a life worth living, and that you touched countless lives while having an impact that may very will reverberate through all eternity. Those two words just don’t seem like enough...yet let me say them from the bottom of my heart - Thank You. I was recently at a conference about the social and emotional needs of children today. While much of what I heard reinforced what we were already seeing as a campus, it was fascinating - the idea many children today are unaware of how to communicate effectively, show and understand empathy, understand their feelings regarding shame, or even the ability to read the emotions of others. 1. Where do academics fall? 2. Whose responsibility is it to tackle all of these concerns? When I was growing up schools had one job: Educate through the teaching of content. Each year it seems the social and emotional needs of our students continue to grow. This, of course, causes educators everywhere to reevaluate our practices, and look at what we can do moving forward to continue to ensure our students are successful. Yet, as I continue to learn about the needs of our students, the more I am finding that content becomes step two in the learning process. While I know some may not agree with me, if we are honest with ourselves I truly believe we can’t help but find that the answer to my first question...Where do academics fall? Is found second to whether or not our students are mentally ready to learn. Brain research, social emotional learning, restorative practices...all game changers in the world of education. Why? It’s really two fold...First, our students learn best when they are mentally engaged and ready to take on new challenges. Second, many of our students today come to school unprepared to learn, unprepared to communicate, or unprepared to understand the social dynamics of the classroom. It is important to note that as the needs of our students change, as demands for individualized education for every child increase, as the needs for social emotional support grow...we as educators must continue to learn and adapt. This is no easy task as the challenges of education continue to change. Teaching today is no longer solely about content knowledge and memorization. Technology, collaborative expectations, and an ever shrinking world has changed the tools our students need in order to be successful. Yet, while content is still vital to student success in a world of high stakes testing, we know we can’t get there until we ensure the whole child is being cared for emotionally. This of course leads right into my second question...Whose responsibility is it to tackle the social and emotional needs of our students? The answer...educators of course. While I truly believe this starts in the home, many students come without a foundation to build upon in the classroom. Which means many teachers have two options...adapt and learn to educate and support their students, or ignore the social and emotional needs and just focus on content. Yet, there is really only one option...Show me a teacher who loves children, and I will show you a teacher ready to learn to meet his/her students’ needs. Classroom teachers, counselors, administrators...each day these educators play the role of parent, nurse, food provider, cheerleader, therapist, and of course...teacher. As our world changes so does our profession, and while I acknowledge we need to continue to grow and adapt, it is daunting to realize the answer to my second question… Whose responsibility is it to tackle all of these concerns? … is in fact, the school’s. When I entered college as a freshman I knew I was going to graduate as a teacher...it’s what I always wanted to be. Yet despite four years of learning, including one year of student teaching, I left without the fundamental understanding that things were going to change the second I left. I didn’t realize that the learning was never going to stop. That each year brought something new, and that no two years are ever alike. I had no idea that one day I was no longer going to hold all the knowledge in the room...Of course, back then, if you would have told me that students could ask their watch a question and get an answer immediately I would have said you were crazy...so it makes sense changes are always going to come. In the end there is one thing all educators must remember...we never stop learning. We are never done growing, never done improving, never done learning something new. It seems each year brings new challenges and ideas...the world continues to change, and the expectations placed on our students for the future do as well. Today we are seeing an increase in our understanding of how the brain works, and finding there are very serious social and emotional needs within our classrooms...so what do we do? We learn, we change, we adapt...because after all, we are educators, and educators never stop learning. Try, if you can, to imagine the following without the ability to include relationships: Religion, politics, work, education, family, friends... it's scary isn't it? The removal of relationships could easily result in emptiness, pain, loneliness, anger, bitter assumptions and a lack of purpose. Faith without relationship can often result in religious rules, regulations, judgement, and acts of works required for salvation. Politics without relationships can often result in split views, an inability to come together, and an unwillingness to embrace love, and instead embrace hate or close-mindedness, no matter what party you find yourself in. Friendship without relationship is no longer a friendship at all. Rather, two people, near in physical location, but distant in emotional connection and purpose. But what about education? Where does relationship belong in the world of education? Teachers, Students, Families, and Community...the big four in our educational world. School and Community: It's amazing how powerful change can be when a school and community come together. When a neighborhood, a district, a city come together in relationship in order to make a difference. My school has been blessed to partner with churches, a synagogue, businesses, and other schools all with one goal in mind...How can we support our students and teachers? How can we love on them both? How can we make a difference one life at a time? A school is a living entity, and in order to flourish fully, I truly believe ii needs community support and partnerships. Teachers and Teachers: As I have written about before, it’s amazing how lonely being a teacher can be. It’s amazing how a person can feel extremely isolated as the only adult in a room filled with students. When your job is to educate, to love, to facilitate, to support, to fill instructional gaps and create an environment where curiosity reigns...yet are responsible for the safety, knowledge, and security of each student within the room...the job becomes one of immense responsibility, that is often held by the teacher, and the teacher alone. The list of things a teacher does each day is extensive to say the least, and I can’t imagine the burnout rate that would happen if teachers were required to face the challenge of teaching alone each and every day. The relationships teachers have with each other is vital to their success - both instructionally and emotionally. Relationships between teachers bring support, understanding, friendship, thought partners, and a better school community for each other, and for our students. Teachers and Parents: The value of a supportive parent is priceless. The relationship between parents and teachers is an often overlooked or undervalued asset that can be the key ingredient to a student’s success. When teachers and parents work collaboratively together, and create a supportive relationship that looks much like a partnership, a student's instructional gains, behavior, and performance can increase at a much higher rate than in the classroom with the teacher alone. When a parent looks to support rather than seek to blame, interfere, or be overly critical, a successful and beneficial partnership can be formed, and one that can last for years to come. Students and Students: The best teachers, the very best, are the ones capable of creating a classroom culture that inspires, forms, and develops successful and respectful student relationships with each other. A classroom culture built on the belief that together the class is a family, one built on empathy, integrity, and grace. A community of fellow learners, coming together in order to help each other be the best students they can be...in a safe and creative environment. The relationships our students form in the classroom, and the skills they gain through collaborating each day, will help carry them through their learning career. 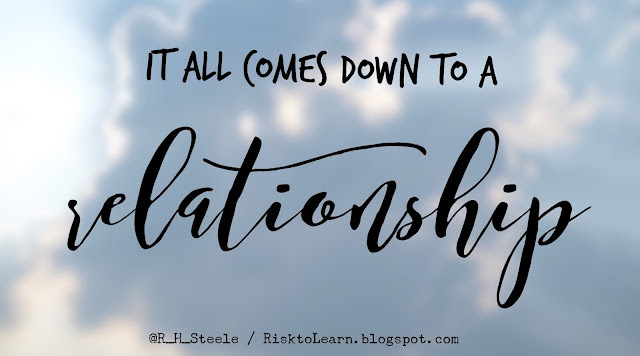 Great teachers know this, and because of this, they focus on teaching and guiding students in the direction of building successful relationships with each other. Yet for educators you have to ask yourself these questions: Am I willing to invest in others when they may not invest in me? Am I willing to offer grace to all students whether they deserve it or not? Am I willing to put in the time and energy it takes to create valuable relationships for my students? Am I willing to model what integrity looks like? What a strong work ethic and passion for learning means? I hope so, because I would love for your face to be the one your students see in their mind’s eye when they are asked one day who made a difference in their lives. Content is valuable, but relationships are everything. A belief in a better tomorrow, a belief in the improbable, a belief in something greater than ourselves. Why it is that human nature tends to lean away from hope and instead steer towards pessimism? Why are we drawn to drama, negativity, and excuses? Why do many who come across an obstacle or challenge begin to feel frustrated, tired, and anxious instead of motivated, intrigued, and hopeful? I live in a world where lives are changed each and every day. I live in a world where teachers plan, create, think, support, educate, love, and persevere each and every day. I live in a world where hope is needed to provided longevity and balance. Hope overcomes pessimism, and only hope can provide the meaning I need. Hope can come from many different places, people, belief systems...for me hope is Jesus Christ. For me, hope comes from a Savior. For me, hope comes from serving something greater than myself, with the understanding that it’s not about me. Yet wherever hope comes from for you, guide it, embrace it, and understand that our future depends on it. Each day thousands upon thousands of men and women across this country go to work each day with one objective in mind...today, I will make a difference in the lives of the students I teach. Today, I will give my students a reason to learn, and a reason to push further in their knowledge. Such a hopeful profession. You see, as a new teacher I quickly became overwhelmed with the idea of making a difference for every child. I quickly began to crumble under the pressure of test scores needed, growth measurement targets required, and the sheer volume of needs that came through my door each day. I began to be pessimistic about my ability to teach and the daily challenges I faced. I began to take comfort in stories colleagues would share about what they were unwilling to do as opposed to risks they were willing to take. I began to embrace the difficulty of the job not as a challenge, but as a reason to believe reaching every student just wouldn’t be possible. In essence...in my first year I was not hopeful. The power of that statement came from the hope inside it. The hope for a bright future. The hope of a purpose for every child. The hope that every child can be anything he or she wants to be, and can have an amazing impact on the world. As a teacher, hope means every child has the potential to reach heights they never knew possible. Hope means that their socioeconomic status does not dictate their future. Hope means that a love for teaching transcends the challenges that might enter the room each day. Hope means teaching is about far more than worksheets and tasks, but rather risk taking and creativity. Hope means anything is possible...and when one hopeful teacher turns into two, and then three, hope begins to take hold, and a belief in a community, a belief in each other, and a belief in our students turns into a hope for a successful school not just academically, but socially, emotionally, and culturally. As we enter 2017 it is my goal to continue to search for and hang onto the hope we have in this profession. To turn from pessimism and embrace the hope for a better tomorrow. I pray you will join me...because after all, without hope what chance to do we really have to make the difference we all hoped to make when we entered our profession. There was a time when the purpose of taking a photo was to capture a moment you wanted to treasure, and then place that moment into a book for you or your family to see later… Dozens of photos, captured on film, waiting to be developed, sometimes over months. There was a time when getting lost meant finding a map or a pay phone. There was a time when questions asked in a group like, “Who starred in that president’s movie with Redford?” or “Is it supposed to rain tomorrow?” would have required a trip to the movie store to find out it was Dustin Hoffman or waiting for the 10 o’lock news to find out there was a 70 percent chance it was going to rain. Of course, times have changed, and changed rapidly. While I don’t think change is bad, and the power of knowledge has never been more accessible, there is a challenge that has continued to grow in the world of education each and every year...a dilemma really...instant gratification. The power of Google is a wonderful thing, getting instant feedback is quite amazing, yet…there is something lost in the art of not knowing. We live in a world, we live in a society, that is focused on self...focused on self-image, self-worth built on the number of likes received from a photo or statement. Our students are growing up in this world, in this society where faces are constantly looking at phone screens, cameras take more selfies than any other photo, and answers to questions are searched for instantly. You see, our students are growing up in a world where they wait for very little. It’s truly amazing, television is on demand, answers are online, friends can be reached via text as soon as a thought arrives, photos are shared instantly, and seeing what others are doing is just an app away. There was a time when waiting in line meant waiting...in line...with only your thoughts for entertainment. Office waiting rooms offered magazines for entertainment, and the newspaper was the best way to read about the game you missed or the one that wasn’t shown on TV. So what is the dilemma with instant gratification? Besides of course the creation of millennials? Kidding. While I am not the expert, and don’t pretend to be...there seems to be two major areas of concern that seem to grow each year...Attention and Grit. Attention, stamina, amount of time focused on one concept...however you want to look at it, many students today are coming into classrooms lacking the ability to remain focused for longer than several minutes. It makes sense though...next time you watch a movie, television show, even play a game...watch how often the picture changes. We text using abbreviations because writing “you” takes too long, so just use “u” … Again, we live in a fast paced world, so you can probably imagine just how hard it can be to take an assessment in a quiet environment for an hour plus. I am not saying ADHD is on the rise, I am not saying our kids don’t have the ability, what I am saying is our students are growing up in a world built on instant gratification, and when school demands a focus on the process...when school demands undivided attention...when a school demands a need for instructional stamina, many of our students do not enter the room prepared because the world does not function in the same fashion. I am not saying that today’s world is worse today than it once was... We just need to understand our reality as educators. Our kids are growing up in a world where answers come quickly. Have a question? Ask Siri. Not sure how to fix something? YouTube it. It’s amazing how quickly we can get what we want, when we want it. The wealthier the family, the less waiting time is needed. Yet even for our students coming from poverty, instant gratification is still alive and well. So how do we tackle this dilemma? Or an even larger question, is this a dilemma? For many educators it is, and tackling it starts with embracing the challenge, and meeting our students where they are. Before frustration comes we need to understand our students, we need to understand where they are coming from, and we need to understand that the world they live in may not look at all similar to the one inside the school building. Attention, stamina, grit, a focus on the process...these things are taught, these things are nurtured, these things are often introduced in the classroom. I truly believe we need to focus on the process of learning. We need to focus on creating a challenging curriculum that invites investigation, rather than asking questions Siri could answer in a matter of seconds. Creativity invites intrigue. Collaboration solves the need for human interaction. A positive environment invites the ability to fail forward safely. The reality is that our students’ needs are changing. The reality is our students live in a world of instant gratification. So should we change instruction to focus on giving our students a curriculum built on instant gratification each and every day? Absolutely not. There is a time and place for all things, yet if we don’t focus on building stamina, creating engaging activities that require grit, and ask questions that go beyond a Googleable question...we are not giving our students the skills they need. There is something powerful that happens when we struggle, when we collaborate, and when we fail forward...our students need to experience this as much as possible, even though that might be quite the difficult challenge.